The term "Peripatetic" is a transliteration of the ancient Greek word περιπατητικός (peripatêtikos), which means "of walking" or "given to walking about". The Peripatetic school, founded by Aristotle, was actually known simply as the Peripatos. Aristotle's school came to be so named because of the peripatoi ("colonnades" or "covered walkways") of the Lyceum where the members met. The legend that the name came from Aristotle's alleged habit of walking while lecturing may have started with Hermippus of Smyrna. Unlike Plato (428/7–348/7 BC), Aristotle (384–322 BC) was not a citizen of Athens and so could not own property; he and his colleagues therefore used the grounds of the Lyceum as a gathering place, just as it had been used by earlier philosophers such as Socrates. Aristotle and his colleagues first began to use the Lyceum in this way about 335 BC, after which Aristotle left Plato's Academy and Athens, and then returned to Athens from his travels about a dozen years later. Because of the school's association with the gymnasium, the school also came to be referred to simply as the Lyceum. Some modern scholars argue that the school did not become formally institutionalized until Theophrastus took it over, at which time there was private property associated with the school. Originally at least, the Peripatetic gatherings were probably conducted less formally than the term "school" suggests: there was likely no set curriculum or requirements for students, or even fees for membership. Aristotle did teach and lecture there, but there was also philosophical and scientific research done in partnership with other members of the school. It seems likely that many of the writings that have come down to us in Aristotle's name were based on lectures he gave at the school. Among the members of the school in Aristotle's time were Theophrastus, Phanias of Eresus, Eudemus of Rhodes, Clytus of Miletus, Aristoxenus, and Dicaearchus. Much like Plato's Academy, there were in Aristotle's school junior and senior members, the junior members generally serving as pupils or assistants to the senior members who directed research and lectured. The aim of the school, at least in Aristotle's time, was not to further a specific doctrine, but rather to explore philosophical and scientific theories; those who ran the school worked as equal partners. The doctrines of the Peripatetic school were those laid down by Aristotle, and henceforth maintained by his followers. Whereas Plato had sought to explain things with his theory of forms, Aristotle preferred to start from the facts given by experience. Philosophy to him meant science, and its aim was the recognition of the "why" in all things. Hence he endeavoured to attain to the ultimate grounds of things by induction; that is to say, by a posteriori conclusions from a number of facts toward a universal. Logic either deals with appearances, and is then called dialectics; or of truth, and is then called analytics. All change or motion takes place in regard to substance, quantity, quality, and place. There are three kinds of substances – those alternately in motion and at rest, as the animals; those perpetually in motion, as the sky; and those eternally stationary. The last, in themselves immovable and imperishable, are the source and origin of all motion. Among them there must be one first being, unchangeable, which acts without the intervention of any other being. All that is proceeds from it; it is the most perfect intelligence – God. The immediate action of this prime mover – happy in the contemplation of itself – extends only to the heavens; the other inferior spheres are moved by other incorporeal and eternal substances, which the popular belief adores as gods. The heavens are of a more perfect and divine nature than other bodies. In the centre of the universe is the Earth, round and stationary. The stars, like the sky, beings of a higher nature, but of grosser matter, move by the impulse of the prime mover. For Aristotle, matter is the basis of all that exists; it comprises the potentiality of everything, but of itself is not actually anything. A determinate thing only comes into being when the potentiality in matter is converted into actuality. This is achieved by form, the idea existent not as one outside the many, but as one in the many, the completion of the potentiality latent in the matter. The soul is the principle of life in the organic body, and is inseparable from the body. As faculties of the soul, Aristotle enumerates the faculty of reproduction and nutrition; of sensation, memory and recollection; the faculty of reason, or understanding; and the faculty of desiring, which is divided into appetition and volition. By the use of reason conceptions, which are formed in the soul by external sense-impressions, and may be true or false, are converted into knowledge. For reason alone can attain to truth either in understanding or action. The best and highest goal is the happiness which originates from virtuous actions. Aristotle did not, with Plato, regard virtue as knowledge pure and simple, but as founded on nature, habit, and reason. Virtue consists in acting according to nature: that is, keeping the mean between the two extremes of the too much and the too little. Thus valor, in his view the first of virtues, is a mean between cowardice and recklessness; temperance is the mean in respect to sensual enjoyments and the total avoidance of them. There are some uncertainties in this list. It is not certain whether Aristo of Ceos was the head of the school, but since he was a close pupil of Lyco and the most important Peripatetic philosopher in the time when he lived, it is generally assumed that he was. It is not known if Critolaus directly succeeded Aristo, or if there were any leaders between them. Erymneus is known only from a passing reference by Athenaeus. Other important Peripatetic philosophers who lived during these centuries include Eudemus of Rhodes, Aristoxenus, Dicaearchus, and Clearchus of Soli. Sometime shortly after the death of Alexander the Great in June 323 BC, Aristotle left Athens to avoid persecution by anti-Macedonian factions in Athens, due to his ties to Macedonia. After Aristotle's death in 322 BC, his colleague Theophrastus succeeded him as head of the school. The most prominent member of the school after Theophrastus was Strato of Lampsacus, who increased the naturalistic elements of Aristotle's philosophy and embraced a form of atheism. After the time of Strato, the Peripatetic school fell into a decline. Lyco was famous more for his oratory than his philosophical skills, and Aristo is perhaps best known for his biographical studies; although Critolaus was more philosophically active, none of the Peripatetic philosophers in this period seem to have contributed anything original to philosophy. The reasons for the decline of the Peripatetic school are unclear. Undoubtedly, Stoicism and Epicureanism provided many answers for those people looking for dogmatic and comprehensive philosophical systems, and the scepticism of the Middle Academy may have seemed preferable to anyone who rejected dogmatism. Later tradition linked the school's decline to Neleus of Scepsis and his descendants hiding the works of Aristotle and Theophrastus in a cellar until their rediscovery in the 1st century BC, and even though this story may be doubted, it is possible that Aristotle's works were not widely read. 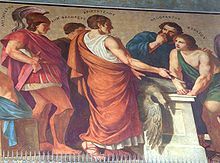 In 86 BC, Athens was sacked by the Roman general Lucius Cornelius Sulla; all the schools of philosophy in Athens were badly disrupted, and the Lyceum ceased to exist as a functioning institution. Ironically, this event seems to have brought new life to the Peripatetic school. Sulla brought the writings of Aristotle and Theophrastus back to Rome, where they became the basis of a new collection of Aristotle's writings compiled by Andronicus of Rhodes which forms the basis of the Corpus Aristotelicum which exists today. Later Neoplatonist writers describe Andronicus, who lived around 50 BC, as the eleventh scholarch of the Peripatetic school, which would imply that he had two unnamed predecessors. There is considerable uncertainty over the issue, and Andronicus' pupil Boethus of Sidon is also described as the eleventh scholarch. It is quite possible that Andronicus set up a new school where he taught Boethus. Whereas the earlier Peripatetics had sought to extend and develop Aristotle's works, from the time of Andronicus the school concentrated on preserving and defending his work. The most important figure in the Roman era is Alexander of Aphrodisias (c. 200 AD) who wrote commentaries on Aristotle's writings. With the rise of Neoplatonism (and Christianity) in the 3rd century, Peripateticism as an independent philosophy came to an end, but the Neoplatonists sought to incorporate Aristotle's philosophy within their own system, and produced many commentaries on Aristotle's works. In the 5th century, Olympiodorus the Elder is sometimes described as a Peripatetic. The last philosophers in classical antiquity to comment on Aristotle were Simplicius and Boethius in the 6th century AD. After this, although his works were mostly lost to the west, they were maintained in the east where they were incorporated into early Islamic philosophy. Some of the greatest Peripatetic philosophers in the Islamic philosophical tradition were Al-Kindi (Alkindus), Al-Farabi (Alpharabius), Avicenna (Ibn Sina) and Averroes (Ibn Rushd). By the 12th century, Aristotle's works began being translated into Latin during the Latin translations of the 12th century, and gradually arose Scholastic philosophy under such names as Thomas Aquinas, which took its tone and complexion from the writings of Aristotle, the commentaries of Averroes, and The Book of Healing of Avicenna. Look up Peripatetic in Wiktionary, the free dictionary. ^ The entry peripatêtikos in Liddell, Henry and Robert Scott, A Greek-English Lexicon. ^ a b Grön, Arne; et al. (1988). Lübcke, Poul (ed.). Filosofilexikonet (in Swedish). Stockholm: Forum förlag. ^ Ostwald & Lynch 1982, p. 623, citing Diogenes Laërtius, 5.39 & 5.52. ^ Spade, Paul Vincent (2018). Edward N. Zalta (ed.). "Medieval Philosophy". Stanford Encyclopedia of Philosophy. Center for the Study of Language and Information. Barnes, Jonathan (2000), Aristotle: A Very Short Introduction, Oxford Paperbacks, ISBN 0-19-285408-9 . Drozdek, Adam (2007), Greek Philosophers as Theologians: The Divine Arche, Ashgate publishing, ISBN 0-7546-6189-X . Furley, David (1970), "Peripatetic School", in Hammond, N. G. L.; Scullard, H. H. (eds. ), The Oxford Classical Dictionary (2nd ed. ), Oxford University Press . Furley, David (2003), "Peripatetic School", in Hornblower, Simon; Spawforth, Antony (eds. ), The Oxford Classical Dictionary (3rd ed. ), Oxford University Press, ISBN 0-19-860641-9 . Hegel, G. W. F. (2006), Brown, Robert F. (ed. ), Lectures on the History of Philosophy 1825–1826: Greek Philosophy, 2, Oxford University Press, ISBN 0-19-927906-3 . Irwin, T. (2003), "Aristotle", in Craig, Edward (ed. ), Routledge Encyclopedia of Philosophy, Routledge . Lieber, Francis; Wigglesworth, Edward; Bradford, T. G. (1832), Encyclopedia Americana, 10 . Lynch, J. (1997), "Lyceum", in Zeyl, Donald J.; Devereux, Daniel; Mitsis, Phillip (eds. ), Encyclopedia of Classical Philosophy, Greenwood Press, ISBN 0-313-28775-9 . Nussbaum, M. (2003), "Aristotle", in Hornblower, Simon; Spawforth, Antony (eds. ), The Oxford Classical Dictionary (3rd ed. ), Oxford University Press, ISBN 0-19-860641-9 . Ostwald, M.; Lynch, J. (1982), "The Growth of Schools & the Advance of Knowledge", in Lewis, D. M.; Boardman, John; Hornblower, Simon; et al. (eds. ), The Cambridge Ancient History Volume 6: The Fourth Century BCE, Cambridge University Press . Ross, David; Ackrill, John L. (1995), Aristotle, Routledge, ISBN 0-415-12068-3 . Seyffert, Oskar (1895), A Dictionary of Classical Antiquities . Sharples, Robert W. (2003), "The Peripatetic school", in Furley, David (ed. ), From Aristotle to Augustine: Routledge History of Philosophy, Routledge, ISBN 0-415-30874-7 . Wehrli, Fritz (ed. ), Die Schule des Aristoteles. Texte und Kommentare. 10 volumes and 2 Supplements. Basel 1944–1959, 2. Edition 1967–1969. I. Dikaiarchos (1944); II. Aristoxenos (1945); III. Klearchos (1948); IV. Demetrios von Phaleron (1949); V. Straton von Lampsakos (1950); VI. Lykon und Ariston von Keos (1952); VII: Herakleides Pontikos (1953); VIII. Eudemos von Rhodos (1955); IX. Phainias von Eresos, Chamaileon, Praxiphanes (1957); X. Hieronymos von Rhodos, Kritolaos und seine Schuler, Rückblick: Der Peripatos in vorchlisticher Zeit; Register (1959); Supplement I: Hermippos der Kallimacheer (1974); Supplement II: Sotio (1978).